Awarded BEST of HOUZZ 2019,2018, 2017, 2016, 2015 and 2014. Virginia (703)728-4191 Maryland (443)597-6437 Custom Made Window Coverings and Motorized Window Treatments specialist Frank and Kristine Ford have been helping in the process of turning houses into homes for over 22 years. Delmarva Blinds & Shutters takes pride in everything they do from the custom consultation to the custom installation and everything in-between. We have been providing Maryland, Virginia and Washington DC with top quality custom window treatments such as custom plantation shutters, wood blinds, composite blinds, cellular shades, roman shades, roller shades, motorized shades, top-treatments, drapery panels and more. We go above and beyond to make sure our clients are 100% satisfied! We make it easy for you to get high quality, affordable custom window treatments by bringing the showroom to your door. We provide a shop-at-home service. Complimentary in-home consultation, free estimate, free professional measuring and professional installation. We absolutely love what we do!!!! I believe that a good designer listens closely to her clients, never imposing her ideas but rather guiding her clients toward a look they have always wanted but never thought possible. My goal is to collaborate with my clients so they can effectively articulate their desired visual outcome – and then get to work making it happen. I was born and raised in the design industry with a family that owned its own fabric design business; thinking in terms of color, texture and form is second nature to me. I received a degree from the New York School of Interior Design and have chosen to focus on window designs. I joined Smith & Noble In-Home Design team because no one else offers such high quality collections alongside stellar customer service. When I’m not at work on a client’s dream design, I can be found reading, hiking, biking, doing yoga or volunteering. ELA Interior Design creates the high quality and unique design for all interiors. We listen to our clients and help them to create a style that is right for them and their environment. ELA Interior has the experience, connections and style to bring your vision to life – on schedule and on budget. Your personal designer will oversee the project from initial consultation to final installation. We don’t rest until you’re delighted. Drapery Designs is one of the top providers of drapery and upholstery products and services in the Washington, D.C. area. Having worked with interior-design clients for over 13 years, our services include providing advisory services to designers, as well as creating custom fabric products for commercial and residential clients. Since its founding, we at Budget Blinds Serving Annapolis have proudly served the local community by offering high quality and stylish window coverings for any occasion. Our goal is simple: to provide you with the best products and services in order to enrich your home environment. Our lavish selection of window treatments includes shutters, blinds, draperies, shades and even window film. Regardless of the window’s size or shape, you can rest assured Budget Blinds Serving Annapolis will have a customized window coverings solution ready for you. Call us today to schedule your free in-home consultation. We’ll bring you the highest quality and most fashionable window coverings in Annapolis and surrounding areas. Looking forward to helping you beautify your home! McFeely Window Fashions is a full service custom window treatment company serving the needs of interior design professionals, architects and homeowners. For over sixteen years, Beth McFeely and her staff have been assisting both residential and commercial clients throughout Maryland, Virginia, and the greater Washington D.C. area. Along with exceptional design and industry knowledge, McFeely Window Fashion boasts an expert team of installers as well as an onsite custom drapery workroom. 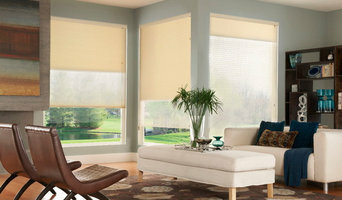 In addition to custom draperies McFeely Window Fashions furnishes a wide variety of blinds, shades, shutters. In order to accommodate different budgets and lifestyles, we carry a wide variety of product lines including: Hunter Douglas, Levolor, Graber, Custom Brands Group, and Norman Shutters. The best part? They bring their services to you! In the relaxed comfort of your home or office, they will guide you through the process of selecting the right design and fabric for your custom window treatments. Since its founding, we at Budget Blinds Serving Alexandria have proudly served the local community by offering high quality and stylish window coverings for any occasion. Our goal is simple: to provide you with the best products and services in order to enrich your home environment. Our lavish selection of window treatments includes shutters, blinds, draperies, shades and even window film. Regardless of the window’s size or shape, you can rest assured Budget Blinds Serving Alexandria will have a customized window coverings solution ready for you. Call us today to schedule your free in-home consultation. We’ll bring you the highest quality and most fashionable window coverings in Alexandria and surrounding areas. Looking forward to helping you beautify your home! Professional Window Treatment Installation Services & Sales and Installation of Plantation shutters. Over 20 years experience **Check out my Projects photos For over 20 years I have been installing window treatments for my wife's business, Sylvie's Custom Drapery & Blinds (pictured above), and several designers/manufacturers in the Northern Virginia area. I have worked with a vast array of custom drapery hung on a wide range of drapery hardware, to include 2 story installation projects. I have also hung numerous brands of blinds. In addition to drapery and blinds I am also selling and installing Interior Plantation Shutters from Lafayette Interior fashions (pictured above). The Lafayette Woodland Harvest Plantation Shutter collection is an all wood shutter that is completely manufactured in Lafayette, Indiana using American wood. It is an outstanding shutter that is built to last a lifetime and add beauty and value to your home. I believe that well-styled windows make a house a home, which is why I love working as a Shop at Home Stylist with Smith & Noble. With several years of interior design experience, I bring a wealth of knowledge and skills to every project I take on. I received a bachelor of science in interior design at Radford University, and worked for years in model home design, staging and residential design. I am often inspired by colors and patterns, and am adept at styling a room around a signature piece, whether it's a rug or a piece of art. I continue to seek new design ideas and inspiration in magazines like Elle Decor and Architectural Digest, and on sites like Pinterest and houzz, where my own work has been featured. When I'm not working on a design project, I enjoy tennis, cooking, reading, traveling and volunteering as a Girl Scout leader. We are a family owned and operated company located in Gaithersburg, Maryland serving Montgomery County MD. Since 1989, we have specialized in custom plantation shutters for our customers throughout Maryland, including the Baltimore and Annapolis areas, Virginia, and Washington DC. 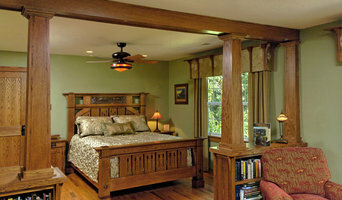 To be the best plantation shutter company takes a commitment to every aspect of our business. Since we ARE the manufacturer and we control every project from sale to installation of our custom plantation shutters, we are able to provide extra attention to quality craftsmanship and the "small details" that make a good job great. Our unique manufacturing process and factory-direct pricing allows us to deliver plantation shutters in about 3-4 weeks at competitive costs. Perfect Fit Custom Shutters has earned an excellent reputation with homeowners and designers for its exceptional quality, custom installation and excellent customer service. *Hunter Douglas Authorized Dealer* Exceptional Views is a boutique, full service window coverings firm serving residential and commercial clients in metropolitan Baltimore and surrounding counties. Exceptional Views approaches each project with professionalism and precision, placing your vision at the forefront of each and every project. CEO and founder Cheryl Millhausen’s singular mission is to create a breathtaking environment that you can’t wait to come home to. Leveraging a long career in window coverings and a background in business, Cheryl provides a uniquely relaxed and personalized experience. Cheryl’s natural talent for design and keen eye for color guide the process to ensure that your own style and individuality shine through… literally!